This is part four of the series of articles on Saint Peterburg, Russia. If I ever get a chance I always visit any type of fortifications: be it Puerto Rico's San Felippe del Morro & San Cristobal, Karlstejn near Prague, or even a tiny little Fort Christmas that's right near our house. Something about the large impenetrable walls, the towers, the heavy doors that just speaks to my soul. Throw in cliffs, moats or portcullis (a spiked metal gate that any self-respecting castle has to have) and I'm on cloud nine. Yet somehow I didn't know Russia had real castles. It makes sense that it would though since it's been around awhile and most countries that were around in Middle Ages have them. And I've visited The Kremlin on the Red Square, Peter & Paul Fortress and knew of the Golden Ring around Moscow, which has plenty of fortresses built around monasteries in churches (kremlin is a Russian name for a fortification actually, not just the Moscow one). I just never thought that there's real, medieval castles. Sadly the two castles we visited out of town weren't as developed and brought into the modern age as the rest of the Saint Petersburg. It would be amazing to bring a huge part of Russian Viking history to the masses instead of just more "Paul this, Catherine that, Decembrists did this, Bolsheviks did that...". Vikings are cool and if marketed I believe would be hugely popular to tourists, but I may be wrong and also realize that it's a huge undertaking. Enough rambling though, let's check out some sweet citadels. Also this post will have very little gold to change the pace a bit. Build on the opposite bank of Neva River from the Winter Palace on the Hare Island (there were a lot of hares living on it in the past), Peter and Paul's Fortress is an enormous fort, probably the biggest one I've ever visited. It's probably about 30-45 minutes walk from the Winter Palace (in the pic below to the left, where the boat is), maybe a bit more. Worth it though - it's incredible. Walking down to the water on the semi-circle walkway is neat - one can see a wedding there pretty much every weekend. The Spit of the Vasilievsky island is beautiful. Note the two red Rostral Columns in front and to the sides of the Old Stock Exchange. Borrowed the aerial shot from the here. The Rostral Columns and Old Stock exchange are visible in the distance as well as the cupola of St. Isaac Cathedral off the bridge leading to Hare Island. Just before the bridge onto the island, there's a faux, but still cool Ship/Restaurant/Gym (there's a small gym in the back of it). Is it romantic or what? The fortress is well lit at night. The entrance. The royal imperial two headed eagle is awesome. There's an enormous open square with cathedrals & the old Mint. Plenty of exhibits (Torture chamber anyone?). The square despite the size takes up only maybe a third of the entire fortress. At noon each day the cannon's go off. We heard it all the time at ITMO - the university where I studied for 3 years until leaving to States - main building was about a mile away or so. Good times! Since it's on Hare Island - there's a couple statues & an enclosure with some rabbits (or hares - I can't tell the difference). On the perimeter. If it's sunny, there's usually quite a few people sunbathing and even swimming in the river. The size of the entire thing is staggering. Right next to the fortress is a museum of military equipment. Somehow I still haven't managed to visit. Getting that sweet tan! One of the few rare examples of Russian-ness we saw during both visits. Another bridge will bring you back to the Hermitage/Nevskiy side of the Neva River - makes for a beautiful several hour long walking tour. Right off the fortress is one of the boat tour launches, which we hopped on. And saw yet another hare. It's about an hour long trip and a definite must. Some canals are wider, some are more tucked in between beautiful buildings. On a beautiful day - so worth it! Upon arrival, we had a choice to buy magnets with our pics (they snapped some shots right before departure - I thought they'd just put it online). It was $10 or so for all four. Those are ceramic little dish looking things with St. Petersburg views and our smiling mugs in the middle. As far as souvenir knick-knacks go - those are definitely in the top. We bought them. Almost forgot - the cathedral inside the fortress is quite pretty on the inside and not overdone as some of the other ones. They also have a cat on staff for mice guard duty. A truly medieval fortress that sat on a piece of land disputed for centuries - Oreshek (or Shlisselburg as it's also known) is about 1.5 or 2 hr bus ride away from St. Petersburg followed by a 10-15 minute boat ride (all part of the tour). Oreshek means "nut" in Russian. As in tough nut to crack. It's not completely restored, but still quite impressive on its own. Pretty sure the tour is only in Russian and it's definitely not as polished of a production as the Peterhof or Catherine's Palace. I don't think there's a bathroom inside the Castle yet... But if your soul yearns to see some real Russian countryside - go for it (helps to have a Russian speaker with you though)! There was both a drawbridge over a small moat (you can see the chains for the drawbridge in the pic above) and a portcullis plus some heavy wooden and metal doors. Proper! The fortress was used to defend against the Nazi invasion in the World War II and still shows sign of artillery strikes everywhere. It's easy to spot the restored parts. Can't wait to see it all completed! Memorials to the fallen defenders in a tore apart building. Part castle, part war museum. One of the mostly finished walls - you can climb up the stairs and walk the wall. Oh yeah, getting the medieval vibes! My castle senses are tingling! It's possible to walk around almost the entire castle and enjoy some lovely views. Once back on mainland - there was a tiny gift shack with an intricate display. Before leaving back to the city, we had about an hour or a little more to explore the little town. We climbed around some cannons & guns that were in the park. It's a pretty common thing in Russia to have tanks, planes, APCs and other old military equipment in little neighborhood parks. Since we're on the topic - on the way back we stopped by an outdoor monument to the break of Leningrad Siege (St. Petersburg was called Leningrad during Soviet times). Tanks! More tanks. Look at the tiny amphibious tank in the middle! Cute! Overall a great castle, just lacking the infrastructure for now. Hopefully, this will be fixed at some point in the future. A little more push of Viking history and it'd be such an awesome day trip destination with so much potential. This a real deal Swedish fortress from the late 13th century. We visited during our second trip to Russia - I was looking forward to it! Except it was the worst day trip out of all the ones we've done. Not so much because of the castle, but rather the way the tour is organized. It was definitely a throwback to the classic Soviet days and definitely service without a smile. First off it's quite a long drive away - 4 hours by bus if my memory serves me right. We drove by the castle and kept going somewhere else... The tour lady kept droning about some random shenanigans that stopped being interesting a couple hours ago and told us we were going to some estate for extra cultural learnings as part of the trip. Once we arrive somewhere - she proceeded to drone for at least 20 or 30 minutes after which we've asked if how much longer does she have left in the story and if we could just go outside and hang out instead of listening about some Duke or something and his affairs... The lady was pissed at our lack of desire to become cultured and wouldn't let us off until her story ended. After yelling at her a bit and starting to call the tour company main office - she finally let us off the bus. There was a fancy wooden entrance to the estate. And a not-so-fancy back alley with very inviting signs to the local cafe... We skipped. Bathrooms were some awful smelling port-o-johns. A dog was sleeping on the rocks. The only decent shot of some sort of chapel on a cliff in the distance. We didn't walk that far. Most roads were just dirt and we weren't sure how long it'd take us. The whole estate was pretty dilapidated and not much to do. So we hung out on the bench until the rest of the tour was ready. The Vyborg Castle itself is quite large and imposing (not as big as Oreshek though). I like the elevated placement - both other fortresses I mentioned sit pretty flat. Before climbing the tower - the climb itself and the platform on the top would definitely not pass the U.S. health and safety codes. It was quite sketchy. We didn't take any pictures - it was a very narrow and steep climb with people going both ways and the platform was quite slippery in rain and I probably just didn't care at that point. 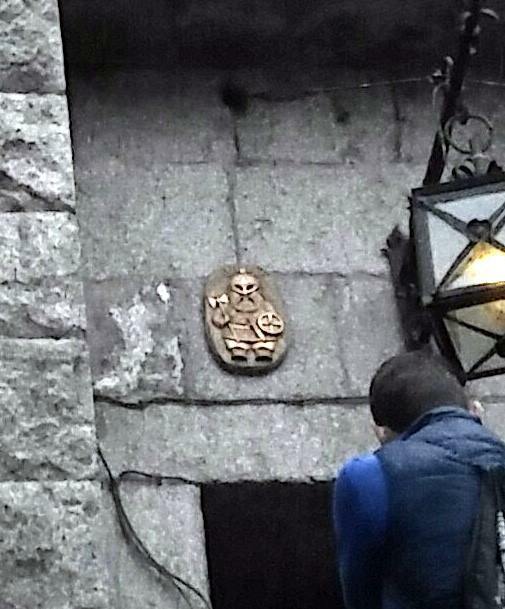 The pic above zoomed in by the door - look at the little viking plaque! Since there wasn't much to do in the castle after the tower and the weather wasn't cooperating, we walked back to town. That's the market building on the main square. We bought a couple of neat magnets - we always bring magnets from all our travels (that's pretty much the only souvenir we buy) and stick them on our gym fridge. So do the members of the gym. It's a very decorated fridge by now. Old cistern or silo from many centuries ago. The highlight of the trip was the Nord-West restaurant right on the same main square with phenomenal food. Since we left the castle a bit early - we had plenty of time to relax, eat some hot Russian food & just think of how fortunate we were with only one fairly bad experience in St. Petersburg. And even then it was really a first world problem. 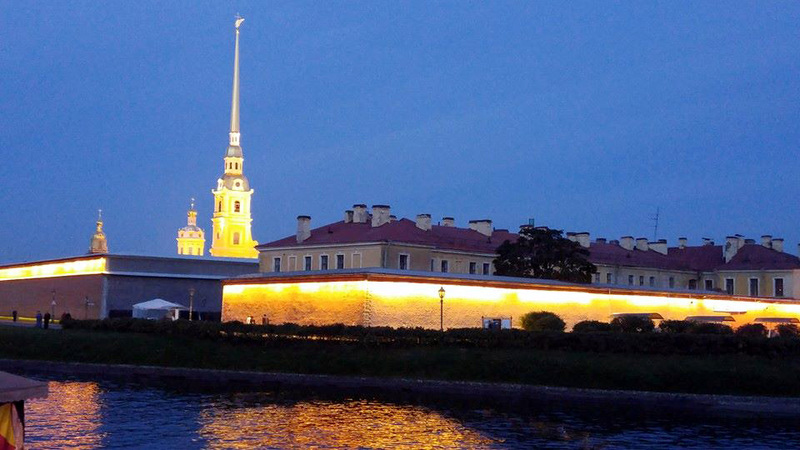 Realistically, most folks would only visit the Peter and Paul Fortress and it'll be an epic experience. Hopefully, with time both castles will be brought into the modern day, but they're not ready yet. P.S. It was the only thing that I wasn't happy with the entire two trips, which is impressive since I'm generally quite critical and harsh (this entire site is partly due to the fact that writing makes me more appreciative and I can catch myself better slipping down the slope of negativity when writing). Oh, Lordy... there's just so many of them!